What happens when you become a business mentoring client of mine? Whilst I do not have a one-size-fits-all intake process, you might expect most or all of the following. Are you married or single or what? How many kids do you have and how old are they? Also stuff about childcare arrangements so we can work out how much time you have for working in your business. Sometimes fewer hours are best! Where do you live in our world – so I can picture you there and in case we have to think about time zone differences and how we are going to make that work for us both? What you are doing for a living now and how much per month do you need to make (in round thousands) not to have to worry about money, so that you are in financial integrity and not in scarcity? How close are you now to that figure? How will you bridge the gap, if any? Where’s the nearest money? Where’s your income coming from today? How much of that is from the business you plan to create? Where would you prefer that it come from? Have you started work on that plan and is it a good one? What are you charging now for your products and services? 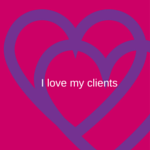 Is that working for you and your clients? What should you be charging? That figure is always in your body and we can discuss why you aren’t charging it yet. You are usually (but not always) charging too little. You know that already. How you might achieve your financial goals? For instance, charging twice as much to half as many people might enable you to give a better quality of service and feel less stressed about your work. What are you future plans, goals, dreams and ambitions? Why are you looking for a business coach/mentor and how can I best support you on your journey? Why are we talking? What strengths and weaknesses do you have that I should look out for? 2. Next I am going to invite you to join one of my two coaching groups – Club 100 or Small Business Big Magic. This will depend upon your budget and how much 1-2-1 time you would like to invest each month. I will show you how to book yourself into my diary for that, or how to receive the invitations to the group calls if that’s the route we decide to go. If either group is not right for you, we’ll discuss alternatives like 1-2-1 personal coaching or the Pay What You Want and Abundance Calls I offer on an ad hoc basis. 3. We will make sure we are Facebook friends so I can add you to the appropriate Facebook Group which will introduce you to the rest of the gang. 4. If you are joining Club 100 I will invite you into the Google Group where we share our Monday morning email check-ins. 5. Then, if you are a blogger, I will add you to my Feedly so I can monitor your blog output and share it with my fans and followers if appropriate. And I can give you feedback on what you are doing well and what tricks you might be missing. I’ll also notice when you are not blogging and encourage you to up your game. I’ll also want to make sure that your website does you proud. 6. I will join your email list so I can see the newsletter you send out regularly (!) and feedback when you do a good one and when I think you might be able to improve your message in any way. 7. I will make you one of my Close Friends on Facebook so I can monitor your output there, Like your Page and follow you on Twitter. This way I am watching how you are marketing yourself online. I can help you promote your business and this is one of the things you can measure and improve. 8. I will keep a loving eye on you and encourage you to come to as much of what’s on offer as you choose. I will notice when you go AWOL and, over the first couple of months, I will get to know you and your business so I get to know when to kick and when to cuddle. 9. We’ll discuss marketing plans and how you are going to become visible online and off so that you can grow your business and have a wonderful life at the same time. 10. I will think about you a lot, often subliminally. You will come to mind when I am pottering about the house, or when I am in the shower or even when I am asleep. I will send on to you via Skype chat or PM on Facebook any thoughts and ideas I have for you which might help. Or share them with you on our next call. 11. I will treat you as an adult and expect you to be as good as your word, to turn up on time for our calls and to do your bit. I can lead you to water, but only you can drink. I will understand when life gets in the way (but not forever, that’s self-sabotage). I will watch you grow and I will be proud of you and of my part in that. We will co-create. 12. I will share my business experience going back over 40 years and my woo woo stuff going back over 20 years. There is no requirement for you to take on either or do it my way. Together we will find ways that work for you and I will share the wisdom I have accumulated from working with hundreds of other small business owners and solopreneurs, in case it helps or informs. I will listen to you and appreciate you and I will hold up a mirror. 13. I will encourage patience and self-care. I will recommend resources. I will accelerate your success and speed your way, making it all seem easier and lighter. I will put a community of like minds around you. We all need that. Do you have anyone in your life and business providing that for you? If not, we should talk. My really useful, flexible and affordable coaching and mentoring starts from as little as £50 a month in Small Business Big Magic or £150 in Club 100.